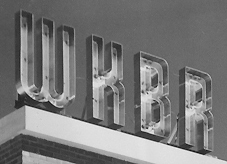 In late 1987, WKBR relocated to The Center of New Hampshire on Elm Street in Manchester. Bob Molloy bought the WKBR building in October 1992. He took the neon WKBR letters off the top of the building and mounted each one in a wooden case that he gave to friends. The Big K was given to former announcer Gary (Duncan) Archambeault. 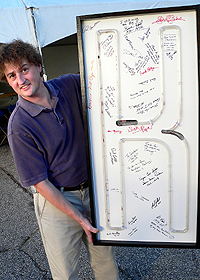 Gary brought it to the 2004 Reunion so former station personnel could autograph it. Entertainment at the 2004 Reunion was provided by DJ George Whitehouse and his daughter, Leah. Click for more 2004 Reunion photos, or a history of WKBR and the 1999 Reunion.